Now, there's another gemstone facial roller on the horizon, but this time it isn't jade. It's rose quartz—the unofficial favorite gemstone of the millennial generation. It's available for preorder now from Herbivore Botanicals, which also happens to produce some of our favorite skincare products. 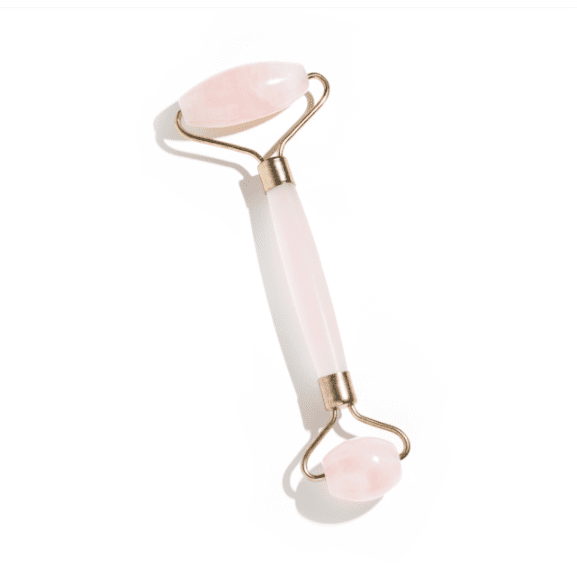 Keep scrolling to see the gorgeous new rose quartz facial roller. According to the brand, the pretty pink stone is spiritually healing, just like jade. "We chose rose quartz because it's one of our favorite crystals to work with! It's the crystal of Venus, the goddess of love and beauty, making it an incredible stone to use with self-care rituals. Rose quartz also helps to soothe the stress, anxiety, and tension that affect many people on a day-to-day basis, which can dramatically affect our skin. By combining one of our favorite crystals with the roller, we felt like it was the perfect tool to make skincare rituals feel even more healing and nourishing," the brand said in a statement. We love the way rose quartz can boost feelings of self-love (which, honestly, everyone could use a little more of, especially in our beauty routines since that's where we tend to be most critical). Just like other facial rollers, this one functions as a tool for lymphatic massage, clearing away toxins and impurities while increasing blood circulation. And by the way, increased blood circulation brings more oxygen to the skin's surface, which results in a glowy and healthy-looking complexion. (Again, it's one of the many reasons I love facial massage.) The brand also promises that it can improve skin elasticity, tighten pore size, and even skin tone, too. "Rose quartz is known as the emotional healer. It can reduce stress and tension that shows up on the skin as dull skin, wrinkles, fine lines, and even acne as stress disrupts our hormones. The properties of rose quartz combined with the benefits of using a roller can help bring back a radiant glow to stressed skin!" Seeing as I love my jade roller so much, I'm sure I'll take to this rose quartz version quickly. I'll use it when my Herbivore Lapis Balancing Facial Oil ($72). It's my current favorite moisturizing product because it's vegan, cruelty-free, and it balances my skin and treats redness. As someone who has naturally red and irritated skin, I think it's definitely a must-have. The rose quartz facial roller available for pre-order now on Herbivore's website, and it will be shipped out the week of November 21. Next, see what happened when one editor used a lip-plumping device for seven days.